Flight Management system works similar to the Smiths FMS version common in Boeing Aircraft. Features include loading stored flight plans, holding patterns, VNAV, SID's and STAR's. Creation of from scratch flight plan, Navaids,Sid/Star (plus transitions) and Airways can be selected and included. Insert database navaid or waypoint as direct to waypoint from the current position. A flight plan waypoint can also be selected as a direct to waypoint to jump ahead to that waypoint. When engaged the selected waypoint becomes the new active flight plan waypoint and a new waypoint is inserted at the aircraft's current position. Loads a stored flight plan from the ISG flight plans folder. Fsbuild 2.3 exports to this format as an option from a 3rd party flight planner. Loads a stored FS9 or FSX .pln (xml) formats. Saves the current flight plan in the ISG/Flightplans folder. Create a new flight plan waypoint by entering its latitude and longitude values. Create a new flight plan waypoint by entering the anchor waypoint then the radial and distance from that anchor waypoint. Specify holding pattern location. Enter holding pattern info (leg dist or leg time, left or right pattern) and actives the hold to engage when the waypoint is reached. Multiple holding patterns can be defined (up to 5). A speed and altitude restriction can be defined for a specified flight plan waypoint. When VNAV mode is active it will meet the speed and altitude restriction for the specified flight plan legs. Can also specify climb and descent speed and altitude restrictions. Climb, cruise, and descent target speeds can be specified on the climb,cruise, and descent pages (or preset in the .cfg files). When VNAV mode is active these target speeds are flown in specified flight modes (but speed specified restrictions wil take precedence). Displays current descent path,required descent path, required vertical speed to meet FMC calculated descent path. This information is also reflected on the vertical deviation indicator in the Navigation display. A database Navaid/Fix can be specified as a 'Fix' position in the FMS. When specified the Navigation display will display a range ring and radial from that specified fix location. Navigation Information pages relating to the flight plan route, track, drift , time, fuel, winds etc. 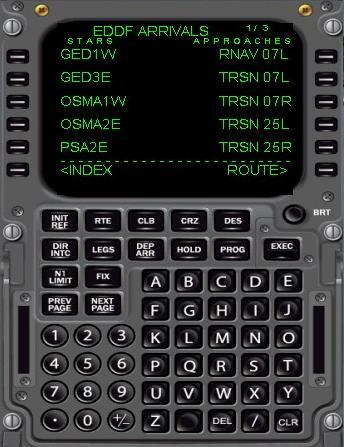 Select and insert Sid/Star procedures into flight plan by name, runway or transition. Select Airway segment into flight plan by specifying entry and exit waypoints. Progress page displays ETA and fuel prediction information for upcoming active waypoints and the destination.